There are different process simulation tools available to oil and gas operators but in general these assume total plant availability, which is rarely the case. Industry data confirms that full production equipment availability occurs only about 5% of the time. The main reasons are equipment failure, shutdowns for maintenance and repair and under performance through deterioration. 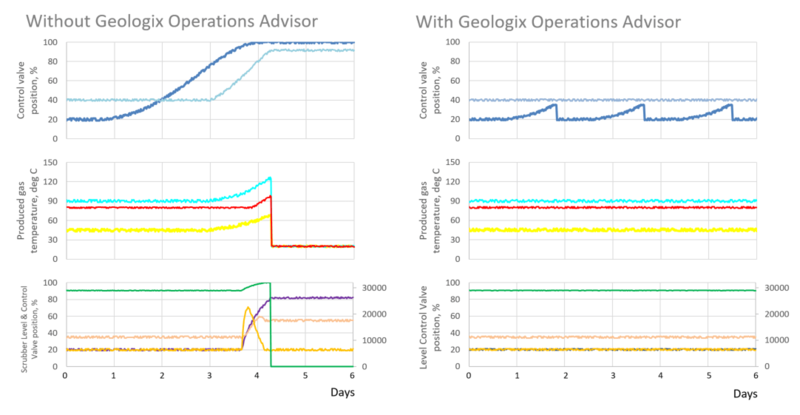 The Geologix Operations Advisor (GOA) operates on real plant data and is not a simulation tool. The overall plant performance can be tracked over a period of time so that GOA “learns” the performance characteristics in different modes of operation. At any time the performance can be analysed and compared with the actual performance during the same mode of operation in a historical time period. Running this analysis on a continuous basis provides the operations staff with ongoing performance trends and will alert them to either temporary or long-term deteriorating performance. A more specific analysis will then reveal the underlying reasons for the deteriorating performance. The following diagram shows example GOA plots of plant characteristics which are key building blocks for determining performance and identifying root causes of deteriorating performance. It is evident that the plant is much more stable with interventions based on input from GOA. The above diagram shows example GOA plots of plant characteristics which are key building blocks for determining performance and identifying root causes of deteriorating performance. It is evident that the plant is much more stable with interventions based on input from GOA.